There are few things I like more than seeing stunning tile installations, new tile designs and meeting creative tile artists! Let's just say I had a pretty stellar day last week when I was combing through the daily emails and found this curious email from the Tile Heritage Foundation. HAPPY NEW YEAR! It’s our pleasure to let you know that your name has been drawn from the group of December 2013 THF Matching Fund Donors, "Fund the Founder's Legacy." You are the recipient of the two wonderful tile panels pictured below! Much to my surprise, as a donor, my name was included in a drawing for this pair of tile panels. What a thrilling surprise! Thank you Tile Heritage Foundation! What a joy to get such a lovely book-ended pair of exquisite tiles. 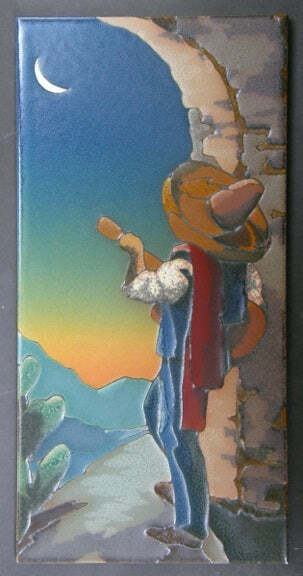 Sheila explained that the Moonlight Mural panels are the creation of Richard Keit and Mary Kennedy of RTK Studios in Ojai, CA. They are both terrific and prolific artists with a curriculum vitae that includes royalty and Hollywood's A-list. 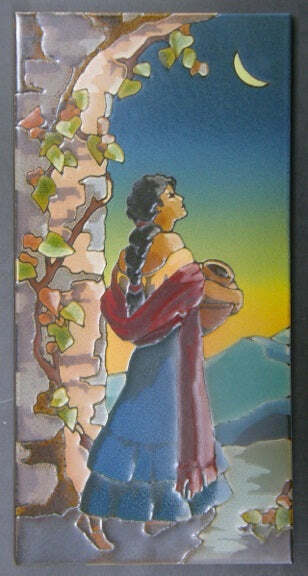 Bill Buyok won this pair of tile panels from the THF in a drawing. 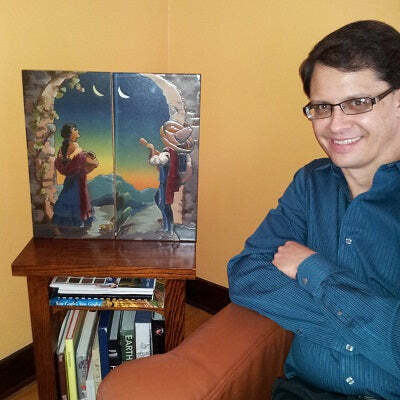 Thank you Richard and Mary - your kindness and support of the THF in this expression of art is greatly appreciated and will be fondly included as part of my Spanish-style home in Los Angeles. Yes, I already know where I want to incorporate this pair of tiles into my home. More on that later. As you might have guessed, I have long supported the Tile Heritage Foundation because of their tireless efforts to both preserve tile as an art form and to inform the public about ceramic tile. To find out more about this great and very generous organization, read a previous post I wrote called, Thanks to the Tile Heritage Foundation. They provide services and information through their staff, library, and collections. Currently, the THF is hard at work developing a web-accessed archive and index of their collection. Keeping these treasures in the public eye for posterity is part of strategic goal for this organization and one that I strongly support. I encourage you to Donate to the THF today! Last week, I received a wonderful email from Interior Designer Eugenia Triandos in Montreal, Canada. She shared an installation photo from a recent project that showcases Avente's popular Cuban Cement Tile! 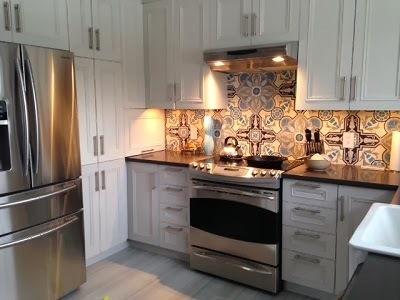 A recent kitchen remodel in Quebec used Cuban Cement tiles. Design by Eugenia Triandos of Triandos Creations. I just wanted to let you know that my project was completed and my clients are very happy with their backsplash. Thanks, Eugenia! I have to compliment you on this beautiful kitchen design. The color choices really stand out. Everything works together using the same color palette as the tiles. Nothing makes me happier than seeing an installation photo and hearing customers that are thrilled about their tile! Now, on to this week's topic. Last week I discussed some important points about grout and cement tile for backsplash design. This week, we'll discuss why polished tiles are the best choice for a cement tile backsplash. One subtle and widely misunderstood aspect of cement tile is the finish. Usually, cement tile is supplied in a raw, or unfinished state. For now, one Western Hemisphere manufacturer allows you to purchase cement tile with a "polished finish," while another will be offering this service in about one year. It's important to know what polishing is, what it does, and why it is so beneficial to have polished tiles for a backsplash application. If polishing is a new term or confusing, start by reading my post that answers the question, What is Cement Tile Polishing? As I mentioned above, most factories only manufacture unpolished or raw cement tiles. Currently, only one manufacturer, Aguayo Cement Tiles, provides the option to receive factory-polished tiles. Polished tiles have a satin sheen that simulates the finish all cement floor tiles achieve over time with care and use. This sheen develops from abrasive forces acting on the tile from everyday use. Although raw tiles can be polished with a floor buffer and green pad after installation, the sheen won’t develop immediately. Buffing will also remove any surface color bleed on cement tile; but, you won’t be able to use a floor buffer on a vertical backsplash installation. Color bleed is common on high contrast tiles, such as patterns that use black and white. Color bleed occurs when cement tiles, placed in racks, are removed from a water bath that is necessary to strengthen the tiles as they cure. The water picks up trace amounts of pigment and drains down the tile. The dark pigments wash over the lighter areas of the tile, leaving a faint discoloration. This is a normal part of the manufacturing process; but not desirable for backsplash tiles that are in the limelight. 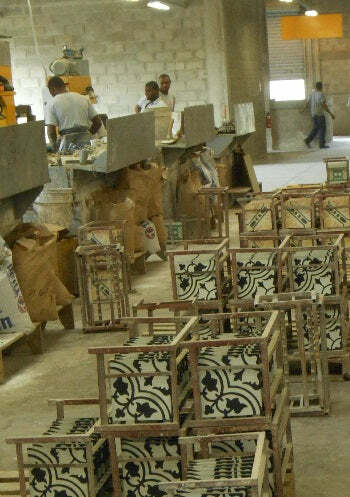 Cement tiles are placed on metal racks to dry after they are made. 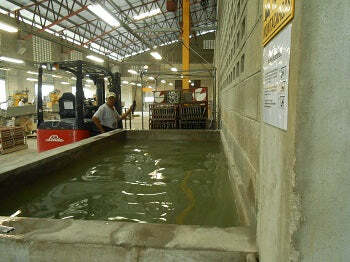 Racked cement tiles are lowered into a water bath to cure for 24 hours. Color bleed can occur when the tiles are removed. Finally, polished tile are usually easier to install because grout doesn't stick to the slightly smoother surface. In general, a grout release is not required for polished tiles. Whereas, on raw cement tile, I think it is a good precaution. As a side note, Cuban Heritage cement tiles are only sold with a polished finish. The only time I don't recommend polished tile is for exterior patio applications. Quite simply, the polishing benefit is lost quickly over time to the elements of wind, wear and weather. Purchase polished tile, if available. Want to find out more? Learn what you need to know before installing a cement tile kitchen backsplash. 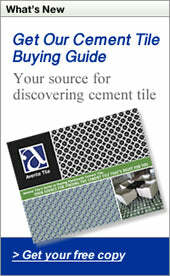 Download and read, 7 Things You Need to Know about Cement Tile Backsplashes. You'll find answers on polishing, sealing, grout, and much more. 7 Things You Need to Know Before You Buy. Do you have a question about using cement tile that we didn't answer here or in our free guide, Cement Tile Backsplashes: 7 Things You Need to Know Before You Buy? No problem! Leave your cement tile question in the comments on this blog and we'll happily answer any questions you may have. One of the biggest trends in cement tile is to use them for a backsplash – primarily a kitchen backsplash – like the one shown here and featured on Houzz by our friends, Philadelphia-based general contracting firm Buckminster Green. In fact, we had more orders for 50-100 sq. ft. of cement tile in 2013 than ever before. This cement tile backsplash design trend makes a lot of sense. Cement tiles provide a powerful design punch that allows homeowners to create a personal statement where it matters most. Cement tiles are available in an array of geometric, traditional and contemporary patterns that can be customized with choices that include palettes with 90 colors. Additionally, these handmade tiles are crafted to endure decades of wear from foot traffic and have a color layer that is about 1/8” thick. They won't face anything that formidable when placed on a wall except for an occasional melee with grease, vinegar, or wine. So, what’s not to like about cement tile? Nothing, really, as long you understand a few key differences. Cement tile is different in many respects than its more ubiquitous cousin, ceramic tile. It’s these differences that often surprise folks and can create a "deal breaker" - an obstacle that can't be overcome or resolved. To prevent that kind of a surprise, we thought we'd detail what you need to know before buying cement tile. Use a very narrow grout line when installing cement tiles. Place cement tiles as close together as possible to create a very thin grout line. Minimizing the grout line will make the design look seamless and your space look larger. We recommend a 1/16” grout joint. Non-sanded (or unsanded) grout is required for grout joints less than 1/8” wide. Pick the right grout color. You may use colored or white grout. If you decide to use colored grout we recommend that it be a color that is the same, or lighter than the lightest color used in the pattern. You can’t use black grout with white or black and white pattern tiles, the dark grout will stain the white parts of the tile and can’t be removed. Expect to spend about $1,000-$1,500 for the tiles and freight, assuming a backsplash area of about 40-50 sq. ft. The cost varies and will ultimately depend on the size, pattern, color and finish of the tile. As another year begins, I always like to take stock of went well for Avente and where the company can improve. I also like to review the year's top selling tiles. This informal review provides some insight as to what's trending in tile. Last year, I reported that for the "first time in three years, a white tile was not our top seller!" That trend continues in 2013; but, white is still a strong contender. In 2013, Avente was sourced for a record number of commercial projects which certainly impacted the top of the sales list. Our top selling tile was tied in the #1 and #2 spots by the same cement tile pattern and colorway: Bayahibe in black and white and the Cluny C. Here's the list! Mission Trebol B 8" x 8" Patterned Cement Tile in Black & White. However, I don't think we will see the growth in cement tiles next year, like we have over the past five years. The market is becoming more mature and cement tile will command a larger market share. Here's a look at top selling cement and ceramic tiles from previous years.